“Much of firm’s history remains a mystery” read the 1996 newspaper byline under a picture of five men in waistcoats and aprons, standing by their cart proudly painted “W Smedley and Sons, Ripley”. The article seemed to have founded on the discovery of a green herbal brew bottle found in a garden on Heage Road. The writer then talked to some of the surviving workers from Smedleys, and people who remembered them. The “mystery” was when and why the firm closed, though in reality it is a sad tale rather than a mystery. William Smedley was a miner who was born in Codnor, working there and moving to Sutton to follow the work. He and his wife Agnes had at least 12 children. 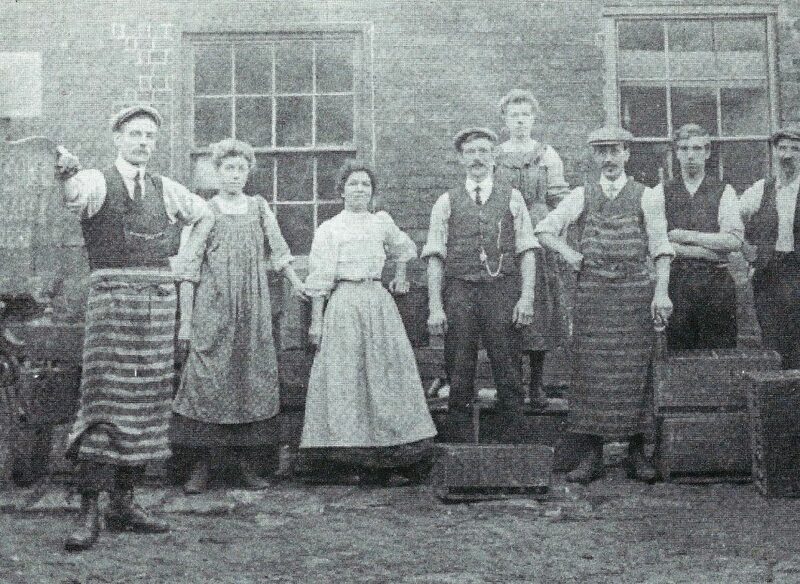 At some point in the 1890s, William, assisted by his eldest sons John, Ernald and Percy, took over the brewing business of the Fletcher family, once owned by one of Ripley’s first doctors W.H. Fletcher and his brother. The business was at first on Cromford Road, then in buildings at the back of Greenwich House (the Fletcher family home) on Nottingham Road. 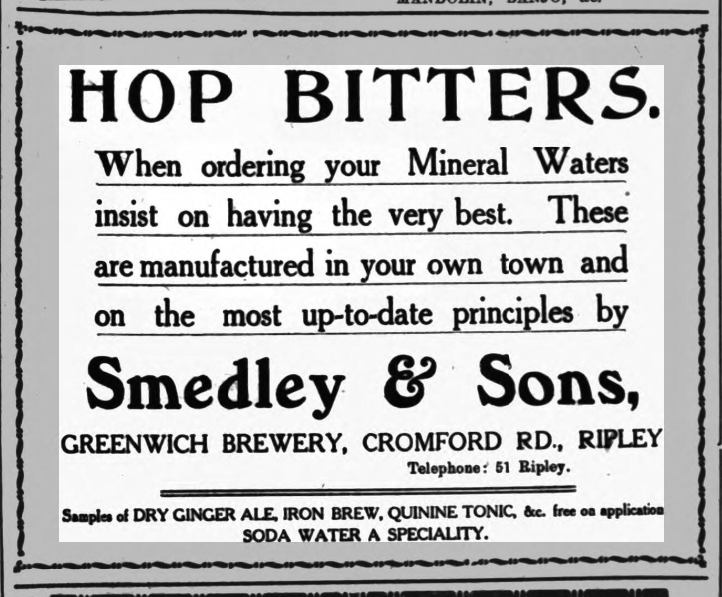 Giving up work at the pit to run their own business must have been quite a gamble, but for a time, it seems as though the firm was successful, concentrating on mineral waters: ginger ale, quinine tonic, soda water and hop bitters, according to their advertisement. Left to Right : Ernald, Ivy, Sally, John, Mary, Percy, Harold and William. At different times, most of the children helped in the business, both sons and daughters. However, by 1911, Percy had moved on to become an assurance agent, Harold an engine driver and the others to various trades, leaving only John and Ernald with their father, now in his sixties, helping. John seems to have left the business soon afterwards, and in late 1914, Ernald caught the flu and was ill for some weeks. He had a partnership with a Mr Glossop, but that too was dissolved and he had to move premises back to Cromford Road, to a location he considered unsuitable. The business was wound up, and in January 1916, all the fittings and equipment in the factory were auctioned off. They included engines, bottling machines, a syrup plant, three dray carts and “Mary” and “Robber”, two dray horses. His brothers and sisters, it seems, wanted nothing to do with the mineral water factory, and who can blame them. Sadly, all that is left now are a few bottles with the Smedley name on them.